Polarized capacitors are capacitors which can be connected only in one polarity. That is, the positive and negative terminals cannot be changed. 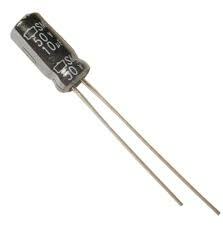 Electrolytic capacitors which use capacitors which use rubber, paper or glass are examples of non-polarized capacitors. Electrolytic capacitors are examples of polarized capacitors. In these capacitors the polarity is fixed. The positive and the negative terminals of the capacitor should be connected properly. Interchanging the positive and negative terminals can cause the capacitor to explode.